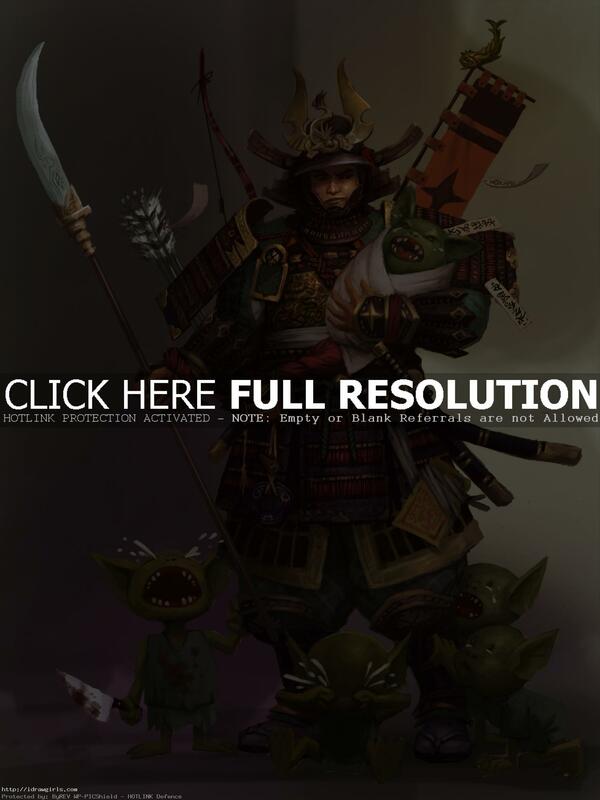 Photoshop digital painting tutorial Samurai character concept art. In this tutorial, I will show you simple step by step instruction. This is my usual character creation process. This illustration is another assignment from a client. Client will give me description to go of from. 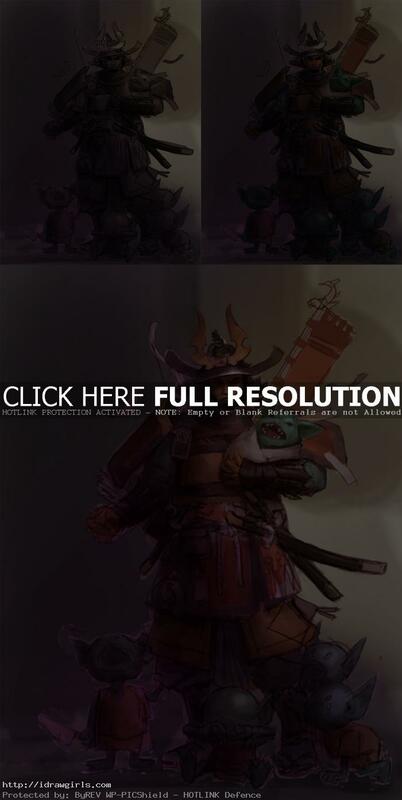 About the character, the samurai is in a bad situation. He’s killed all the goblins, but now he’s found a number of goblin babies. What should he do? He’s holding a crying baby goblin swaddled in rags and several other tiny goblin babies are at his feet. The samurai has a confused and concerned. First thing I usually do is sketch a rough character base on the description. I sometimes will create a lot of variations. If it is the subject I already familiar with, I will just dive right in. Or I will have to do some research before hand. Again I would strongly recommend that you focus values first then the rest will follow. Thanks again for all the kind comments and support. Hopefully this tutorial will help you somehow. 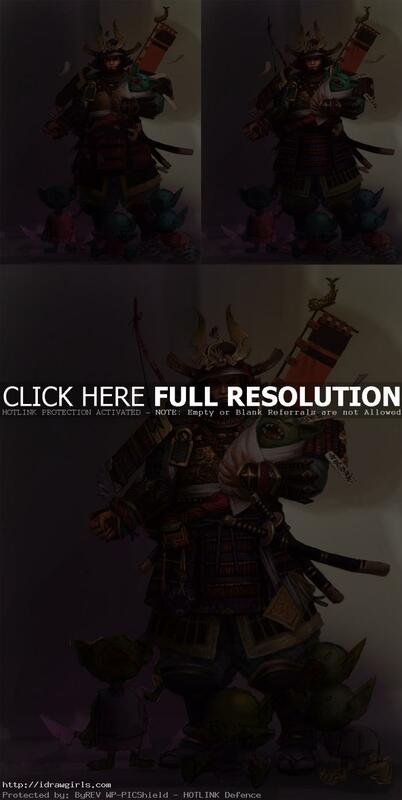 Below are step by step digital painting tutorial, how to paint a samurai character. Keep in mind that this is a simple step by step tutorial, I do what I can in my free time to make quick short and simple tutorial. Step one, I sketch a basic samurai guy with traditional armor. I also assign basic value or gray scale onto the figure. 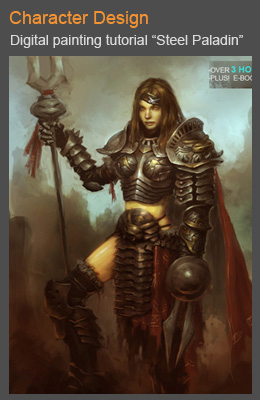 I will just skip the drawing part since this tutorial is more toward intermediate digital painting. Step two, I then apply more color over the figure. 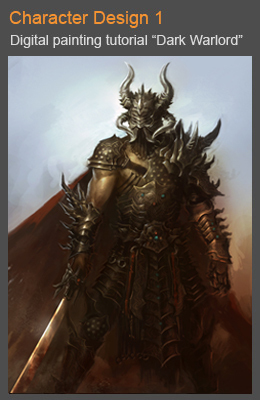 If you are familiar with my tutorial, I usually start off with monochromatic. From step three, I just paint with color to start with pick base color for skin, hair and clothing. I also paint his facial feature. Step four, I rearrange lighting and color get his clothing different texture like wood, cloth and metal along with his decoration. Step five, I keep adjust his lighting until I get him to look the way I want. Step six, I finalize the image. Here are some video demo of how I usually paint a character. This one is with little or no narration. This is amazing Xia! You amaze me everytime.